The Japanese family drama Shoplifters has received the coveted award for best film, the Palme d'Or, at the Cannes Film Festival. The runner-up Grand Prix went to US director Spike Lee's anti-racism satire BlacKkKlansman. Led by actor Cate Blanchett, the jury announced their top picks after what was a politically charged festival. Disgraced Hollywood mogul Harvey Weinstein, who sparked the #MeToo movement, was particularly called out. 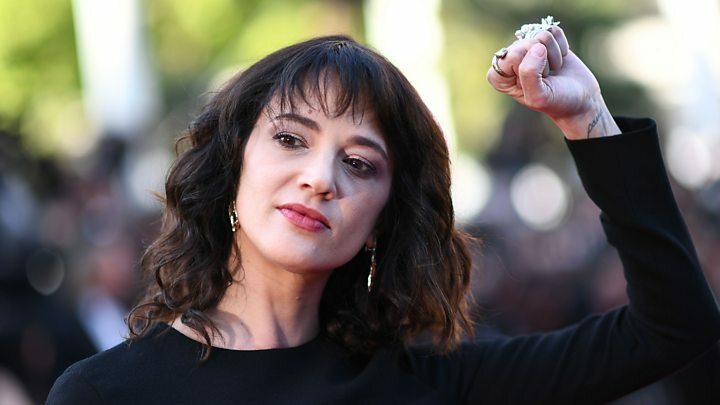 While presenting an award, Italian actress Asia Argento said: "I want to make a prediction: Harvey Weinstein will never be welcomed here ever again." Media caption"We know who you are, and we're not going to allow you to get away with it any longer." Mr Weinstein, who has since retreated from the spotlight, has denied all allegations of non-consensual sexual activity. Only three female directors were among the 21 in contention for the festival's 71st top prize, many of which drew critical acclaim ahead of the famously unpredictable awards night. Choosing the winner of festival's top gong, which went to Japanese indie filmmaker Hirokazu Kore-eda, was "painful" in light of the strong competition, said Blanchett. Quiz: What's been banned in Cannes? Poland's Pawel Pawlikowski won the best director award for his love story Cold War. Little-known Italian actor Marcello Fonte won best actor for his role as a hapless cocaine-dealing dog groomer who faces down a thug in Dogman. And a special Palme d'Or was awarded to French-Swiss Jean-Luc Godard for the film Image Book.